14 Commercial Real Estate & Properties in Labrador are listed in 4 categories. We have 8 Development LandsSale , 5 Retail ShopsSale , 1 Hotels and LeisureSale and 1 ShowroomsSale . Approved Development Within High Demand Location Offers To Purchase - Clos..
2 Stage Development of 2 x 10 levels 111 units with 2 Street Frontages Prominent Location Offering Great Lifestyle Amenities Spectacular View Corridor with Ocean and Broadwater Views JV Scenarios Welcome Land Area 2,794m2 Motivated Sellers Offers To Purchase on or before 22nd of March 2019. For further information contact Brad Merkur 0414 389 300. Approx Disclaimer: Ray White has not independently checked any of the information we merely pass on. We make no comment on and give no warranty as to the accuracy of the information contained in this document which does not constitute all or any part of any offer or contract by the recipient. Prospective purchasers / lessees must rely on their own enquiries and should satisfy themselves as to the truth or accuracy of all information given by their own inspections, searches, inquiries, advices or as is otherwise necessary. No duty of care is assumed by Orchid Avenue Realty trading as Ray White Surfers Paradise Commercial divisions toward the recipient with regard to the use of this information and all information given is given without responsibility. Long Term Established Restaurant Investment - Fronts Broadwater Auction Thurs 25th Octobe..
Nett Income $103,500pa , tenant pays 100% of Outgoings New 5 + 5 year lease, long term secure tenant Leased to the long established Aqua Front Restaurant' Lease commenced 1/6/2018 Total area 185m2 (110m2 Internal + 75m2 external exclusive use area) Well positioned fronting the Broadwater within the prominent Aqua Building High yielding secure Investment opportunity with strong guarantees! Auction Thursday 25th October, 11am Gold Coast Turf Club, Bundall ( Approx) This property is being sold by auction or without a price and therefore a price guide can not be provided. The website may have filtered the property into a price bracket for website functionality purposes. Disclaimer: Ray White has not independently checked any of the information we merely pass on. We make no comment on and give no warranty as to the accuracy of the information contained in the email which does not constitute all or any part of any offer or contract by the recipient. Prospective purchasers / lessees must rely on their own enquiries and should satisfy themselves as to the truth or accuracy of all information given by their own inspections, searches, inquiries, advices or as is otherwise necessary. No duty of care is assumed by Orchid Avenue Realty trading as Ray White Surfers Paradise Commercial divisions toward the recipient with regard to the use of this information and all information given is given without responsibility. If you receive this email in error, please advise us immediately. If you are not the intended recipient of this message, you are notified that you must not disseminate, save, forward, disclose, copy or use this information. 141 Muir Street, Labrador, is an exceptional opportunity for either a builder developer and or an astute investor to purchase and build the development with a great holding income. Land Area 809m2 20 metre frontage on Muir Street Medium Density Residential (RD5) Highly sought location Approx Disclaimer: Ray White has not independently checked any of the information we merely pass on. We make no comment on and give no warranty as to the accuracy of the information contained in this document which does not constitute all or any part of any offer or contract by the recipient. Prospective purchasers / lessees must rely on their own enquiries and should satisfy themselves as to the truth or accuracy of all information given by their own inspections, searches, inquiries, advices or as is otherwise necessary. No duty of care is assumed by Orchid Avenue Realty trading as Ray White Surfers Paradise Commercial divisions toward the recipient with regard to the use of this information and all information given is given without responsibility. Vendors Circumstance Requires Immediate Sale Ideal Residential Development Opportunity Less than 100 metres to Broadwater Parklands Dual Street Frontages Land area 9484m2 Zoned Medium Density Residential Height limit of circa 95 ft (10 Levels) Rare opportunity for over 9,000m2 on major road view corridor exists for multi level units. Close to all amenities, major shopping centres and public transport. 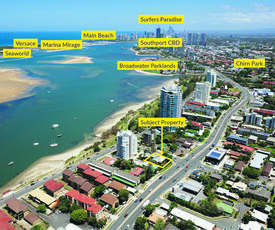 Vendors circumstances requests immediate sale of prominent development site adjacent to the Broadwater Parklands. The subject property houses around 70 individual tourist lots plus backpacker and powered caravan sites. The property offers enormous potential for a significant development for mixed use residential and unit blocks. The sites location is only 4km to central Surfers Paradise and has direct access to public transport. For further information contact Brad Merkur 0414 389 300 Simon Robertson 0449 951 772 Approx Disclaimer: Ray White has not independently checked any of the information we merely pass on. We make no comment on and give no warranty as to the accuracy of the information contained in this document which does not constitute all or any part of any offer or contract by the recipient. Prospective purchasers / lessees must rely on their own enquiries and should satisfy themselves as to the truth or accuracy of all information given by their own inspections, searches, inquiries, advices or as is otherwise necessary. No duty of care is assumed by Orchid Avenue Realty trading as Ray White Surfers Paradise Commercial divisions toward the recipient with regard to the use of this information and all information given is given without responsibility. Land area 1.55ha Zoned Medium Density Residential Over 80 metres of frontage on Olsen Avenue Would suit Terrace / Townhouse and Unit Development May suit additional commercial uses Close to Harbour Town Shopping Centre, Gold Coast University Hospital Light Rail and Griffith University Previous application for 297 units Huge price reduction Approx Disclaimer: Ray White has not independently checked any of the information we merely pass on. We make no comment on and give no warranty as to the accuracy of the information contained in this document which does not constitute all or any part of any offer or contract by the recipient. Prospective purchasers / lessees must rely on their own enquiries and should satisfy themselves as to the truth or accuracy of all information given by their own inspections, searches, inquiries, advices or as is otherwise necessary. No duty of care is assumed by Orchid Avenue Realty trading as Ray White Surfers Paradise Commercial divisions toward the recipient with regard to the use of this information and all information given is given without responsibility. Proposed Townhouse In Chirn Park / Labrador All Offers Considered Ove..
Land Area: 2769m2 , Zoning: low density residential 2 street frontage development site 50 metre frontage on Musgrave Avenue Corner position 350 metres to Chirn Park Shops / Cafes 1.4 kilometres to the Broadwater 2.4 kilometres to Griffith University, Gold Coast Hospital and Light Rail All offers presented! Approx Disclaimer: Ray White has not independently checked any of the information we merely pass on. We make no comment on and give no warranty as to the accuracy of the information contained in this document which does not constitute all or any part of any offer or contract by the recipient. Prospective purchasers / lessees must rely on their own enquiries and should satisfy themselves as to the truth or accuracy of all information given by their own inspections, searches, inquiries, advices or as is otherwise necessary. No duty of care is assumed by Orchid Avenue Realty trading as Ray White Surfers Paradise Commercial divisions toward the recipient with regard to the use of this information and all information given is given without responsibility. Located right next to Aldi and surrounded by busy retail shops including cafe, takeaway food, bottle shop, laundromat and butcher: 70m2 metre shop Blank canvas ready for your fit out Undercover exclusive use basement car parking Secure storage area Store front Potential to install grease trap A rare retail opportunity in a successful and high traffic retail centre don't delay. Vendor has given clear instructions for a sale! Approx For further information on this property, please contact Adam Young on 0424 191 252 Disclaimer: Ray White has not independently checked any of the information we merely pass on. We make no comment on and give no warranty as to the accuracy of the information contained in the email which does not constitute all or any part of any offer or contract by the recipient. Prospective purchasers / lessees must rely on their own enquiries and should satisfy themselves as to the truth or accuracy of all information given by their own inspections, searches, inquiries, advices or as is otherwise necessary. No duty of care is assumed by Orchid Avenue Realty trading as Ray White Surfers Paradise Commercial divisions toward the recipient with regard to the use of this information and all information given is given without responsibility. If you receive this email in error, please advise us immediately. If you are not the intended recipient of this message, you are notified that you must not disseminate, save, forward, disclose, copy or use this information. UNDER CONTRACT Development Approval for residential apartment building with breathtaking Broadwater views 2,016sqm corner site with frontage to Robert Street and Frank Street Approved for a 21 storey building with ground plus basement parking and roof terrace 98 apartments plus two recreation areas Located only 6km from the Surfers Paradise retail centre, and 2km from Southport CBD For further information please contact the exclusive agents on the links above. A massive 8107m2 of level land in the heart of Labrador. Dual entrances on Government Road and Central Avenue, so development can easily be staged. 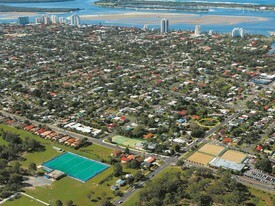 Great position for Griffith University, Gold Coast University Hospital and Broad water access. The property has an existing double storey dwelling on the Central Avenue entrance. Zoned Residential Domain For more information please contact Ray White Commercial GC South Principal, Jared Hodge. Freehold shop priced at a competitive entry level. Tenant in place. Purchase as a Tenanted Investment or Owner occupy. Modern 47m2 shop in shopping strip of 10 mixed businesses. Fully air conditioned with tiled flooring. Neighbouring shops doing well. Situated in dense residential area Plenty of parking for your customers. On busy suburban street intersection. Low Body Corp at only $60 per week. Prime DA approved site located along the stunning Broadwater in high growth North shore corridor Corner position, exceptional Broadwater and ocean coastline views positioned on Broadwater side of Frank Street (Gold Coast Highway) Stunning architectural design, all units have north aspect, good cross flow ventilation large balconies DA for 55 units including 47 x 2 bedrooms, 5 x 3 bedrooms and 3 x 1 bedroom apartments Holding income of $79,820 gross per annum, existing block of 4 units adjoining house. Approx. Disclaimer: Ray White has not independently checked any of the information we merely pass on. We make no comment on and give no warranty as to the accuracy of the information contained in this document which does not constitute all or any part of any offer or contract by the recipient. Prospective purchasers / lessees must rely on their own enquiries and should satisfy themselves as to the truth or accuracy of all information given by their own inspections, searches, inquiries, advices or as is otherwise necessary. No duty of care is assumed by Orchid Avenue Realty trading as Ray White Surfers Paradise Commercial divisions toward the recipient with regard to the use of this information and all information given is given without responsibility. This property is being sold by auction or without a price and therefore a price guide can not be provided. The website may have filtered the property into a price bracket for website functionality purposes.